This is the latest documentation for the current Splunk integration with VictorOps. The VictorOps and Splunk integration allows teams to schedule queries or alerts in Splunk to monitor system health. The VictorOps integration with Splunk can be leveraged to collect data about the overall release toolchain and deployment success to allow teams to collaborate around that information in the timeline. Here you’ll find step by step guides for integrating VictorOps with Splunk Cloud, Splunk Enterprise, Splunk ITSI and Splunk SII products. 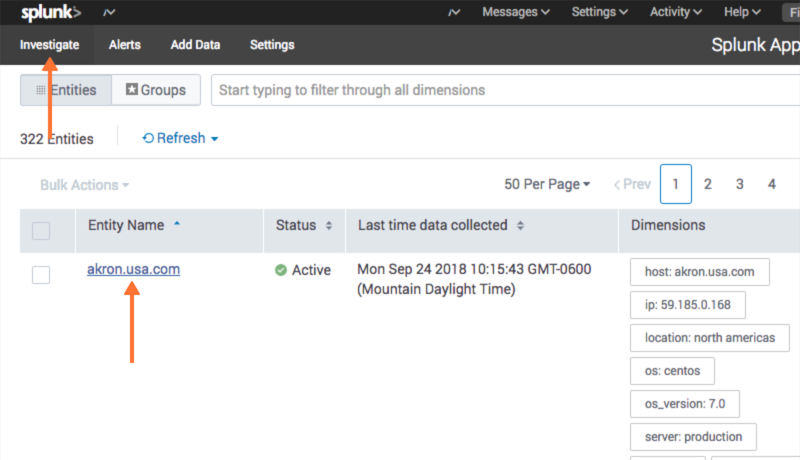 While the out-of-the-box notification methods in Splunk are great for reports and non-critical information, there’s next-level functionality gained when teams integrate Splunk with the VictorOps platform. If you would like to proceed with installation with SHC (search head clustering) or with a proxy setup please contact support for specific instructions. Additionally, on-prem customers will need to open port 443 for outgoing https communication with VictorOps. The full url used will be https://alert.victorops.com/integrations/generic/20131114/alert/$your_api_key/$your_routing_key. Splunk transforms machine-generated data into valuable insights that can help make your business more productive, profitable and secure. The following guide will walk you through integrating VictorOps with action alerts from searches in Splunk Enterprise and cloud. You will need an active VictorOps instance before you begin. Click here to start a free 14-day trial. 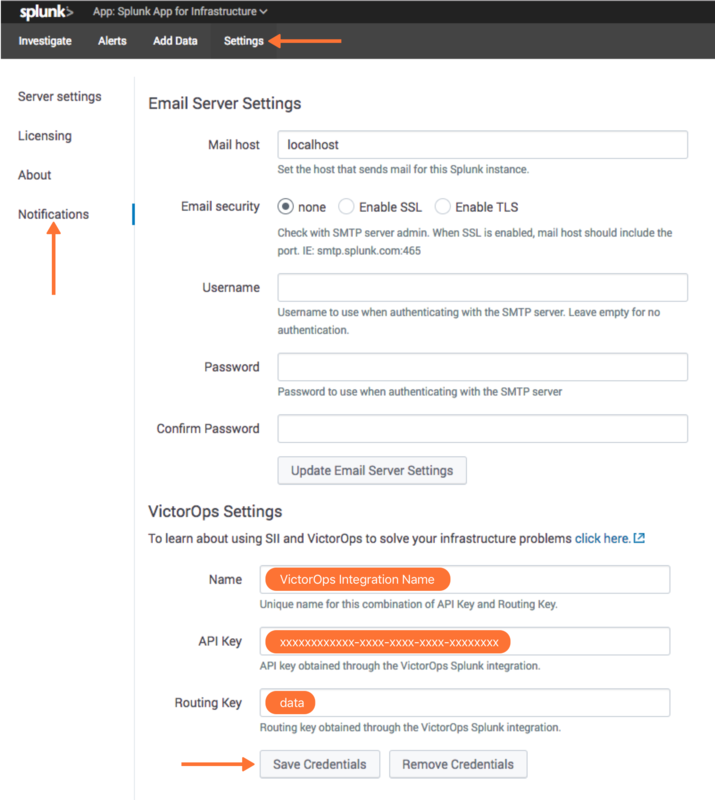 From the VictorOps web portal, select Settings, then Alert Behavior, and Integrations. Click the Splunk, Inc integration option. Copy the API key from the “Service API Endpoint” field to the clipboard (This is the section after “…/alert/” and before “/$routing_key”). From the Splunk Base, search for VictorOps, or follow this link. Click the Download button and accept the license agreements by checking the boxes and clicking Agree to Download. Start Splunk and open the web UI in a browser. From the top navigation bar, expand the drop down menu and select Manage Apps. Next, click the button Install app from file. Choose the VictorOps for Splunk app .tgz file downloaded earlier, check Upgrade app box to ensure your application is updated to the latest version. Click Upload then finish the process by restarting Splunk. Once Splunk has restarted, return to the Manage Apps page and click Set Up next to the VictorOps app. On the set up page, paste the api key copied earlier, along with any routing key from your account. VictorOps can now be used as an Alert Action. to send a test alert directly to your VictorOps timeline. To create an incident, simply change INFO to CRITICAL. If you have any questions, please contact VictorOps support. Here is an example of setting up a new alert based on a search. From a new search select Save As, then select Alert. Give the alert a title, description and permissions as well configure the check schedule. Under + Add Actions, select VictorOps. Select the desired message type, and use the state message field to add a brief description of what this particular alert indicates. You may overwrite the default values for the routing key and entity_id if desired, however, you should understand how best to use these fields. Additionally, you can dynamically reference Splunk fields within these assignments using tokens. Once the specified conditions are met, you should see an alert appear in your VictorOps timeline. Note that if you receive an error while updating you API key “Error while posting to url=/servicesNS/nobody/victorops_apps/storage/passwords/” please follow the steps below to update your API key. You can compare hash values in the passwords.conf and .bak to determine if there’s a changed API key. This is documentation for integrating Splunk ITSI (IT Service Intelligence) with your VictorOps account. 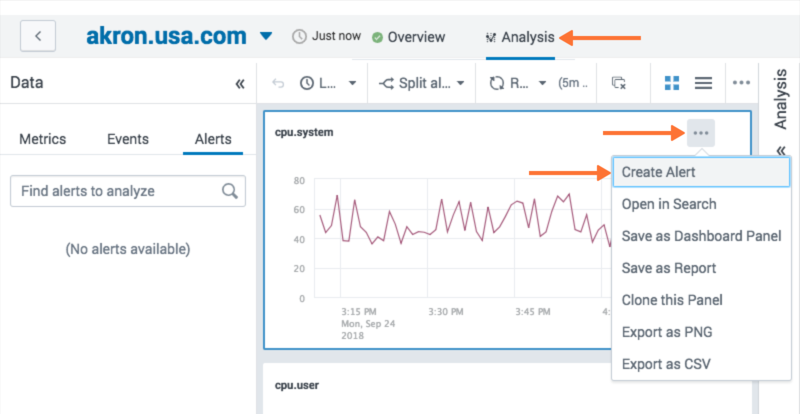 Splunk ITSI is a powerful AI-powered monitoring and analytics solution that allows for incident prediction and prevention. 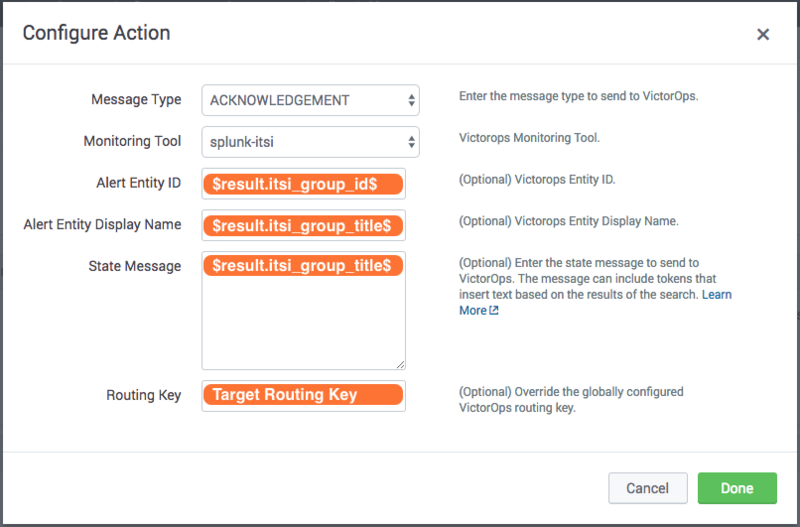 VictorOps for Splunk: available in the splunkbase HERE. 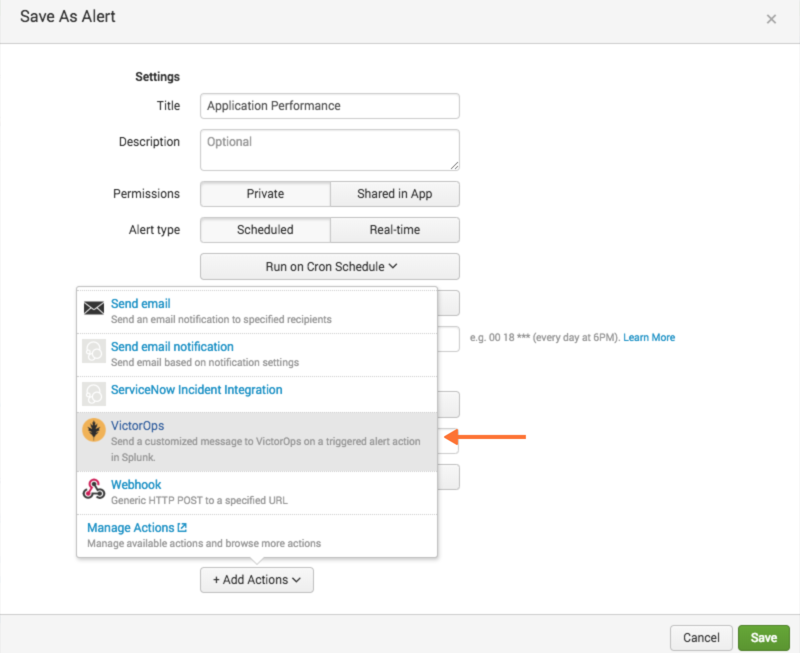 From the VictorOps web portal, select Settings, then Alert Behavior, then Integrations. Find and select the Splunk ITSI integration option. Navigate to Configure >> Notable Events Aggregation Policies >> then click the name of the Aggregation Policy you want to alert VictorOps. 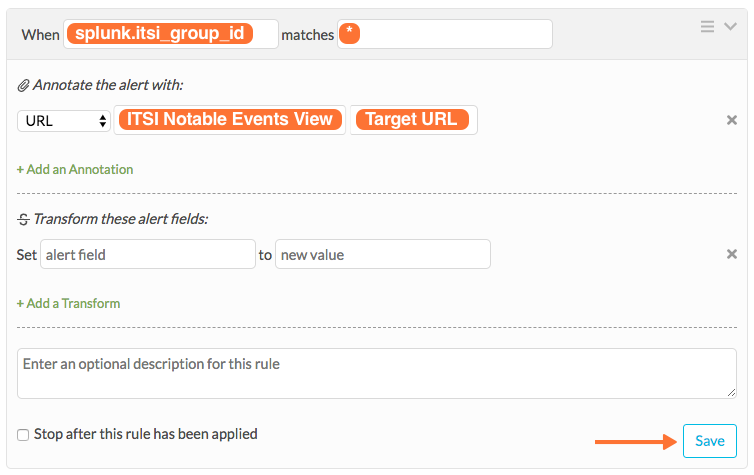 In the Action Rules tab, set your trigger conditions then choose VictorOps and configure your alert accordingly. Keep the Alert Entity ID consistent for all Message Types across related actions. VictorOps uses this field to identify incidents and correlate subsequent alerts with the original incident. Once configured correctly, ITSI will pipe directly into your VictorOps Timeline. Navigate to the Action Rules tab for the desired Aggregation Policy. For an action to create an incident in VictorOps, set the conditions to if the following event occurs: severity greater than Normal then select VictorOps and click Configure. Within the same Aggregation Policy, navigate to the Action Rules tab. To resolve the episode in ITSI, select change status to Resolved. To resolve the corresponding incident in VictorOps, set the conditions to if the episode is broken, then VictorOps and click Configure. Navigate to Episode Review then click the desired episode, Actions, and select VictorOps. 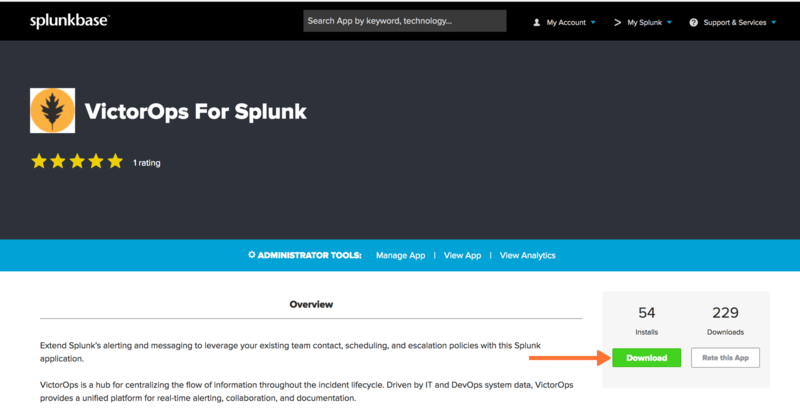 This documentation will integrate Splunk SII (Insights for Infrastructure) with your VictorOps account. Splunk SII is an infrastructure monitoring product that bridges monitoring and troubleshooting by collecting and analyzing both metrics and logs. From the VictorOps web portal, select Settings, then Alert Behavior, then Integrations. Select the Splunk, Inc integration option. Navigate to Settings >> Notifications and paste your API key and and a routing key from your VictorOps account into the respective fields. Click Save Credentials. Now the VictorOps notification can be attached to alert. Under the Investigate page, select an entity. Navigate to the Analysis tab and choose an alert graph, click the three dots and select Create Alert. 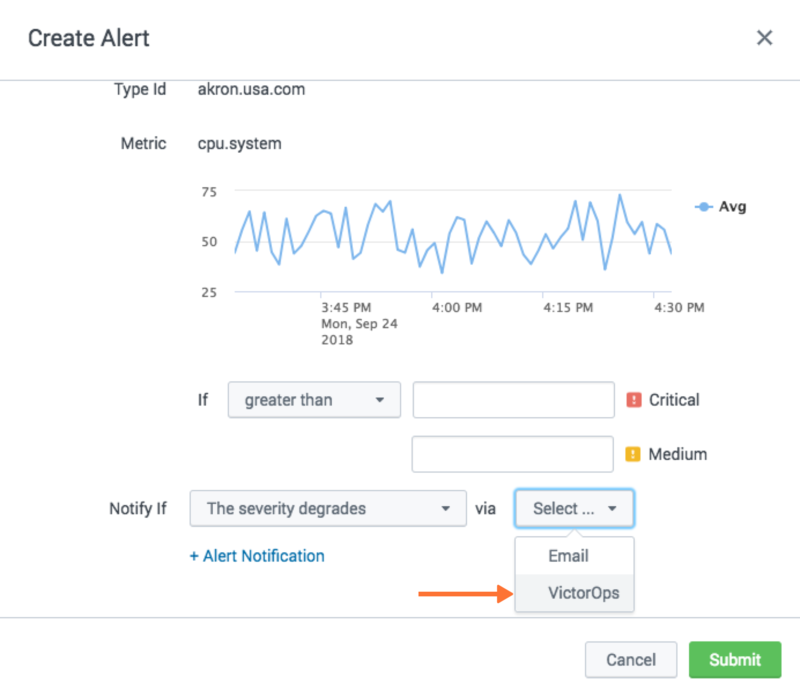 From the alert creation, scroll to the bottom of the modal and choose how under what conditions the alert should fire and then for the notification method select VictorOps. Click Submit.